Although boils are pretty common, they can be very painful and have a negative impact on people's lives. These raised red lumps start to fill with pus as white blood cells rush in to fight the infection. They are caused by infected hair follicles, ingrown hairs or blocked sweat glands and are most commonly found on the face, neck, armpits, shoulders, back and buttocks; typically areas that are sweaty and hairy. Areas of friction, such as the inner thighs, are also common sites to find boils. They can in fact appear anywhere on the body. The pain usually increases as pus collects under the skin, then eases as fluids begin to drain. Normally boils can be treated at home with the following treatments but sometimes a trip to the doctor is necessary if it's is a particularly stubborn boil accompanied by mild fever or if it is in a very awkward area of the body. Often conventional treatment involves antibiotics and in some cases even 'lancing,' a process that can leave scarring. Boils are not officially contagious however the bacteria in the pus is transferable if it enters open skin e.g. a cut. Unfortunately, boils are not completely preventable but their frequency can be greatly reduced, as can their duration when treated at the appropriate time. 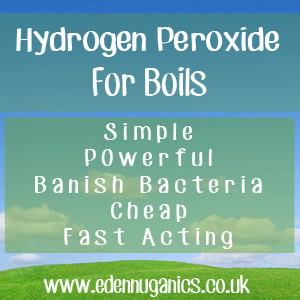 Hydrogen Peroxide is an affordable natural treatment for boils. This simple liquid, consisting of two hydrogen and two oxygen atoms, possesses a wide range of antibacterial, antiviral and antifungal properties that can destroy the bacteria responsible for the infection and therefore reduce the frequency and duration of these nasty abscesses. The first step is to bring the boil to a head (bring the pus to the surface). This can be achieved by applying warm compresses to the area every hour until a white spot forms on the boils surface. It is important to use a clean compress each time so as not to spread the infection. Using a sterile blaze or needle make a small hole in the surface of the boil. If any bleeding occurs its wise to wait for it to stop before applying peroxide as it will stop the blood from clotting. Soak a small piece of tissue in H2O2(hydrogen peroxide) and cover the affected boil. This can be held in place with the use of medical tape or a plaster. This is an important step to keep the area sterile which will greatly help the healing process. Repeat steps 1 - 3 a couple of times per day until the boil has completely drained. Naturally Heal Dermatitis, Boils, Eczema and Rosacea. Apple Cider Vinegar - Apple cider vinegar is a natural liquid with a plethora of antimicrobial properties that make it perfect for dealing with even the most stubborn of boils. The process is exactly the same as above except replacing the hydrogen peroxide with apple cider vinegar. Warm Compress - A warm compress will decrease the pain and help draw the pus to the surface. Once the boil comes to a head, it will usually drain naturally. This usually occurs within 10 days of its appearance. You can make a warm compress by soaking a clean flannel in warm water and squeezing out the excess moisture. Using hot compresses will speed up the cycle of the boil bringing the pus to the surface for drainage. Onions - The humble onion is actually packed full antiseptic germ-busting agents that can not only fight off bacteria, but also help to increase white blood cell production in the area. Cut a thick slice of onion, place it over the boil and wrap the area with a clean cloth or bandage. Change the onion every three to four hours until the boil comes to a head and drains. Cautions: If the red area around the boil starts to dramatically increase in size this could be a sign that the infection is spreading and professional medical care will be required. In addition, people suffering from diabetes or weakened immune systems may want to seek the advice of a doctor before attempting natural remedies.